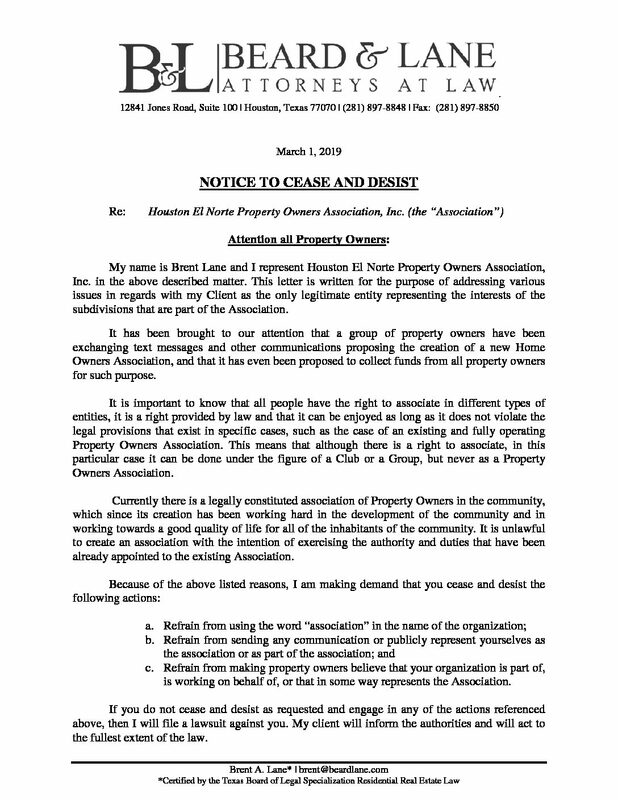 Please see attached letter to all property owners from the Attorney representing Houston El Norte Property Owners Association, Inc. The agenda for this meeting has been set. Questions will not be addressed from the floor. If you have questions about this meeting or, suggested agenda items for future meetings, you can contact the Managing Agent (936) 570-0132 or submit your concerns in writing to: Houston El Norte POA, Inc., P.O. Box 1920, Conroe, Texas, 77305; or, info@chpmanagement.com. If you cannot attend in person, you may vote by Proxy by accessing the Proxy form online at www.houstonelnortepoa.com under “Resources”. Proxies must be received by the Association by the date of the meeting, and no later than the time of check-in/registration at the meeting. Two (2) positions on the Board of Directors will be filled at this election. We hope that you are able to attend. If not, you can vote by Proxy. All owners are entitled to one vote per lot. If you wish to make a nomination or have your name placed into nomination for the positions available on the Board of Directors, please send a brief resume or statement to CH&P Management so that your name or nominee’s name may be added to the ballot. Nominations will also be accepted from the floor at the meeting. Those nominated from the floor must be present or provide a letter stating their approval and desire to serve as a Director of the Association. Should you have any questions or comments for discussion at the meeting, they should be submitted in writing to CH&P Management no later than February 5, 2019. All questions will be addressed after the official meeting has adjourned during the time allotted. This process will be used to conduct an orderly and informative meeting. Call to order and introductions. Hear from Liberty County Sheriff’s Office and discuss service provided with Liberty County Law Enforcement Contract, having four total deputies to serve Montebello, Bella Vista, Rancho San Vicente, Camino Real, Grand San Jacinto and Santa Fe subdivisions. Discuss and take action regarding the approval of the purchase of Microsoft Office for hired deputies so that more of their reports may be done from the patrol vehicle, instead of the Cleveland Annex. Discuss and take action regarding the approval of additional phone lines. Discuss and take action regarding the approval of relocating street lights, provided for bus stops. Bus stop locations have been provided by Cleveland ISD Transportation Department. Take action regarding the approval of August 29, 2018 Meeting Minutes. Discuss moving some funds to a higher interest bearing account. Discuss subdivision entrance sign progress. Discuss and take action regarding plumbing for water fountain installation at Rancho San Vicente, Montebello and Bella Vista community parks. Discuss and take action regarding the installation of purchased soccer goals, for Montebello and Bella Vista community parks. 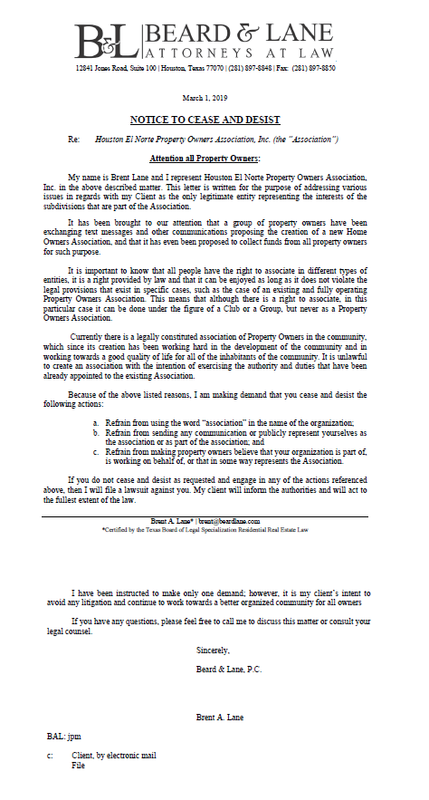 Discuss and take action regarding ditch mowing contract for Santa Fe, Section 1. Discuss and take action regarding meter pole installation and lighting at Santa Fe mailbox pavilion. Discuss and take action regarding parking lot maintenance and culvert replacement. Discuss animal control and animal shelter issues. Discuss the possibility of sidewalks and speed bumps in the subdivisions. Discuss Cleveland ISD updates and concerns. Discuss nature trail in Bella Vista. Discuss and take possible action regarding homeowners having loose animals. Hear from Colony Ridge Development regarding development updates. Discuss and take action regarding approval of expenditures. Discuss and take action regarding legal action for delinquent accounts. Executive session may be needed. Esta no es la Reunión Anual de Miembros/Propietarios. Esta reunión estará abierta al público, pero solo se permitirá un tiempo limitado para que los invitados hablen. Llamar a orden e introducciones. Escuchar a la Oficina del Sheriff del Condado de Liberty y discutir los servicios prestados con el Contrato de Cumplimiento de la Ley del Condado de Liberty, con cuatro oficiales en total para servir a las subdivisiones Montebello, Bella Vista, Rancho San Vicente, Camino Real, Grand San Jacinto y Santa Fe. Discutir y tomar acción con respecto a la aprobación de la compra de Microsoft Office para oficiales contratados para que se puedan hacer más de sus informes desde el vehículo de patrulla, en lugar del Anexo de Cleveland. Discutir y tomar acción con respecto a la aprobación de líneas telefónicas adicionales. Discutir y tomar acción con respecto a la aprobación de la reubicación de las luces de la calle, proporcionado para la parada de camiones. Las ubicaciones de las paradas de los camiones han sido proporcionadas por el Departamento de Transporte de Cleveland. Discutir y tomar acción con respecto a la aprobación de los Minutos de la Reunión del 29 de agosto 2018. Discutir y revisar las finanzas. Discutir movida de algunos fondos a una cuenta con mayor interés. Discutir el progreso de los señalamientos de las entradas de las subdivisiones. Discutir y tomar acción con respecto a la plomería para la instalación de fuentes de agua en los parques comunitarios Rancho San Vicente, Montebello y Bella Vista. Discutir y tomar acción con respecto a la instalación de las canchas de futbol comprados para los parques comunitarios de Montebello y Bella Vista. Discutir y tomar acción con respecto del contrato de corte de zanja para Santa Fe, Sección 1. Discutir y tomar acción con respecto a la instalación y la iluminación de los postes en el pabellón de buzones de Santa Fe. Discutir y tomar acción con respecto al mantenimiento del estacionamiento y el reemplazo de alcantarillas. Discutir el control de animal y problemas de refugio de animales. Discutir la posibilidad de aceras y reductores de velocidad en las subdivisiones. Discutir actualizaciones y preocupaciones de Cleveland ISD. Discutir la ruta natural en Bella Vista. Discutir y posiblemente tomar acción con respecto a propietarios que tienen sus animales sueltos. Escuchar a Colony Ridge Development sobre actualizaciones del desarrollo. Discutir y tomar acción con respecto a la aprobación de gastos. Discutir y tomar acción con respecto a acciones legales para cuentas morosas. Sesión ejecutiva puede ser necesario. Property Owners having property in Santa Fe, Section 1, may begin submitting their ACC Application to Houston El Norte POA for review. An ACC application must be approved prior to receiving any building permits from Liberty County Permit Department. The ACC application period can take 10-30 days for review. If all required items are not submitted, your application will be placed on hold until all necessary information has been received to process the application. Please see ACC Guidelines for complete requirements. We have attached an ACC Application for your convenience. You can submit the application by mail or make an appointment with CH&P Management by calling (936) 570-0132 or emailing info@chpmanagement.com. 1. Call to order and introductions. 3. Discuss and review financials. 4. Take action regarding the approval of April 10, 2018 meeting minutes. 5. Discuss and take action regarding heavy trash removal. 14. Hear from Colony Ridge Development regarding development updates. 15. Discuss and take possible action regarding amending language in the Bylaws. 16. Discuss and take action regarding the approval of expenditures. 17. Discuss and take action regarding referring delinquent accounts to the attorney for collections. Executive session may be needed. This is not the Annual Member/Owners Meeting but will occur after the Annual Meeting has ended. This board meeting will be open to the public but only a limited time allowed for guests to speak. 1. Discuss, review and take action regarding financials and the 2018 Budget. 2. Discuss and take action regarding the approval of minutes for the Board of Director’s Meeting on November 14, 2017. 3. Discuss and take action regarding the election of officers. 4. Discuss and take action regarding the adoption of an advisory committee. 5. Discuss Bylaws regarding Board of Director positions. 6. Discuss and take action regarding approval of expenditures.